As the snow piled up, the February edition of the Coaches Update Newsletter found its way out of the cold to coaches throughout the state, and is available on-line here. This months edition discussed the proliferation of energy drinks such as 5-Hour Energy, and the implications they can have for performance and health. There is in-depth information about the science behind the products, as well as parsing the information provided in the commercials for these products. Previous editions of the Coaches Update Newsletter can be found here. 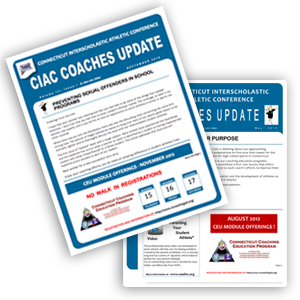 The publication is sent monthly to high school sports coaches throughout the state of Connecticut. Contact Bob Lehr at rlehr casciac org with suggestions for future articles or any other feedback on the newsletter.